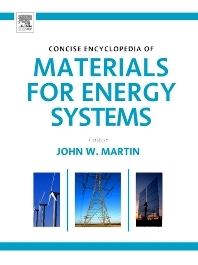 The Concise Encyclopedia of Materials for Energy Systems is a single-volume collection of articles that appear in the Encyclopedia of Materials Science and Technology. It presents a range of energy systems that cover thermal and gas turbines, renewable energy, fuel cells, nuclear power generation (fission and fusion), and the storage and transmission of energy generated. The book also encompasses the hydrogen economy, as well as the materials used in the design of batteries and in the energy-conversion process in a range of devices and actuators. The present volume includes over 100 articles that discuss the applications of engineering materials to energy systems, with an emphasis on the generation of nuclear energy. The anthology helps readers understand the applications of materials of engineering importance, i.e., metals, ceramics, and polymers, to energy systems. The book provides information about materials processing to engineering and materials science professionals, students, and beginners. This volume is of interest to both professionals working with materials/energy in academia and also professionals within both the materials development and energy industries.